I was greatly struck and helped yesterday by these words of the Imitation (of Christ): My child: let me do with you what I will: I know what is good for you”. They gave me courage to place myself without reserve in God’s hands. How happy I feel now that I have done so and made my sacrifice. COMMENT: These brief notes were written during Fr Doyle’s retreat and immediately after he had wrestled against his fears and decided to offer himself for the mission in Congo. They teach us an important lesson – great peace comes from abandoning ourselves to God’s will. Despite our concerns, we have nothing to fear from God’s loving providence. 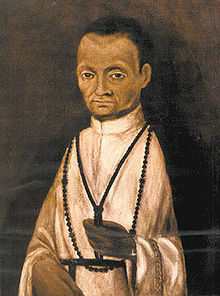 Today is also the feast of St Martin de Porres. St Martin is greatly loved in Ireland – there is an Irish Dominican magazine named in his honour, and I understand that the Irish defrayed a large amount of the costs associated with his canonisation in 1962. St Martin was a humble Dominican lay brother in Peru in the 16th and 17th centuries. He was renowned for his love of the poor and for animals. Significantly, he lived a life of hard penance – his life was more austere than that of Fr Doyle. In adopting this lifestyle, he conformed to the religious culture of his era when physical asceticism was very much the norm. Whenever we consider the penances of the saints, we must remember that they were probably tougher and stronger than we are (modern comforts have made us soft!) and that such penances were absolutely normal in religious life until very very recently. It was Martin’s custom to take the discipline the first time in his cell…There he prayed and flogged himself for three-quarters of an hour with a triple iron chain encrusted with points of iron. He offered his entire body, naked, to the blows because he wished to undergo what Jesus Christ had suffered when he was bound to a pillar, stripped and scourged. Martin’s skin became swollen, broke open under the blows and the blood flowed. A quarter of an hour after midnight Martin scourged himself a second time. The instrument was a knotted cord. This second scourging was for sinners, to make reparation for the offences committed against God, to implore grace so that sinners far from God might return to Him. Finally, near dawn, Martin began the third and most painful scourging…. It seems that this third scourging required the assistance of others. Martin was often so worn out from the other acts of mortification that enlisted the help of servants in the monastery to help. They beat him with branches, and this was offered for the souls in purgatory. St Martin also fasted continuously, more or less constantly living on bread and water, slept on boards and constantly wore a hair shirt and other penitential instruments, and when he died he was found with an iron chain tightly wound around his waist. Why have I reported this acts? After all, holiness and intimacy with Christ absolutely do not necessitate extreme mortifications of this nature, and, to paraphrase Fr Doyle, “do not try this at home” – Fr Doyle was very explicit in his prohibition of others adopting extreme ascetically practices. Fr Doyle, while tough on himself, always urged others to tenderness, and to very simple and moderate mortifications. I have repeated these details from the official Dominican biography of St Martin because Fr Doyle’s penance was mild compared to this daily penance in the life of St Martin de Porres. Martin is absolutely loved by ordinary, simple people around the world. His penance was not a stumbling block to his canonisation, nor a barrier between him and the love and devotion of the faithful. May the example and prayers of both St Martin and Fr Doyle teach us the selfless love of others that they both embodied in their lives.